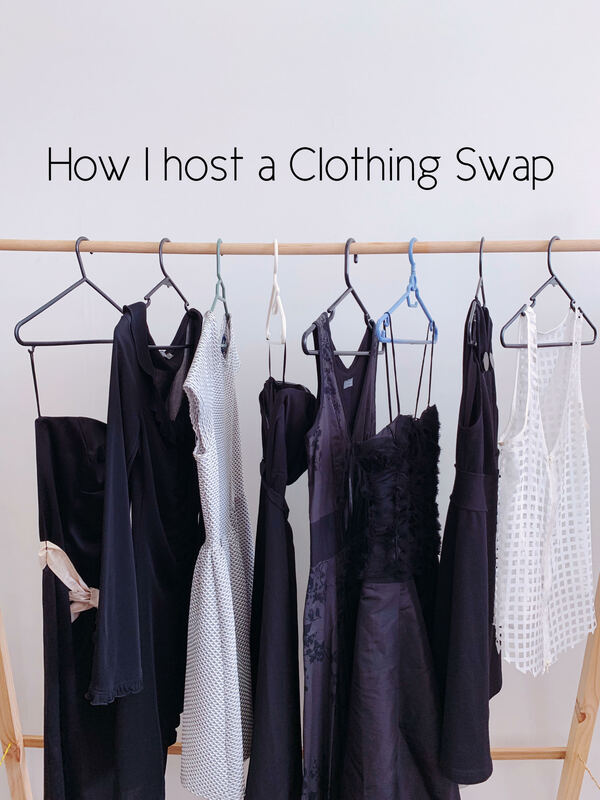 I’ve received a tonne of messages recently asking me to share my exact formula for hosting a Clothing Swap. Running these events is easily one of the best parts about my role as the curator of Biome Eco stores new Slow Fashion Department. 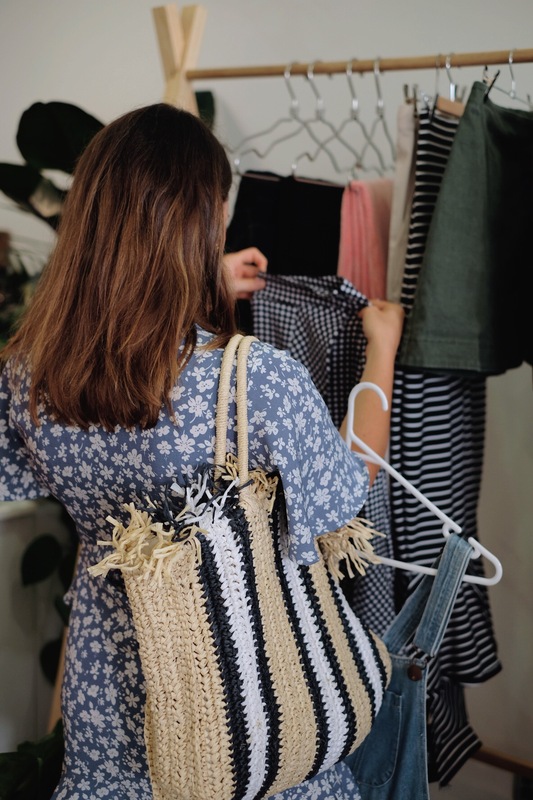 I’m able to connect with so many people in my local community and watch previously unloved clothes find new homes. There are so many different ways to host a swap, however I wanted to share a simple version of exactly how I run them, so that once you understand the general flow it’s easy to mix and match to make it work for you. I couldn’t run these events without my wing woman Jacq – Biomes Workshop Facilitator. 1. Set a participant limit. I’ve found the “friendliest” number for an event is no more than 20 people. This amount means that there are still enough clothes being swapped to bring in a good variety of garments, but not too many people that it gets manic. The space you are hosting your swap in may dictate your participant limit for you. 2. Set a garment limit. We say no more than 10 garments per person. Again, this helps keeps things simple and ensures we don’t have participants bringing along a truck and a half full of clothing. We do allow participants to bring a few shoes/bags if they check in with us first but we don’t openly encourage it incase we have people bringing in 10 pairs of shoes. Again, it’s all about keeping it simple. Having super clear rules about the types of garments that can be brought to the swap helps with quality control and levels the playing field. It would be disappointing if one person brought a bunch of designer dresses and another brought their ratty old gym gear. 4. Set a ticket price – or don’t! This one is totally up to you. If you’re hosting a swap with friends and family it can be nice to also have participants bring a plate of food each so you can snack up a storm once you’re finished. Nothing works up an appetite like the thrill of a good clothes swap! We allow participants to drop off their clothing either the day prior to the swap or within a 1.5 hour window before the event begins. This gives us time to sort, hang and display the garments beautifully and also keep track of who’s given us their clothing. We have a simple guest list and tick off their name as they drop their clothes. For each garment they bring the participant gets 1 playing card (a super easy, affordable token to use). 10 garments, 10 playing cards, 7 garments, 7 playing cards – get it? The playing cards are used as swap currency. 7. A warm welcome, then let the swapping commence! We like to welcome the participants into the space before we allow any swapping to begin. 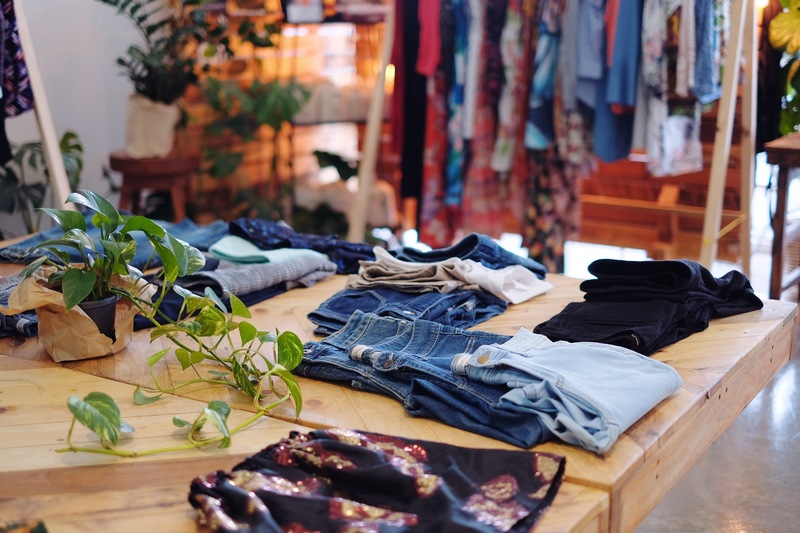 It’s nice to take a moment to explain why clothes swapping is such an important part of the slow fashion movement and this also helps set the tone for the event. Calm is good. We don’t want any frenzied vibes, keep it friendly. Set up a space where participants can pay with their tokens once they have their items. As I mentioned, most of the time people end up taking less than they brought so they’ll probably have some left over tokens. At the end of the day the tokens are just to help keep track of things. Thank your participants and give yourself a big ol’ pat on the back! How do I know there will be clothes in my size? Honestly, you don’t, and it’s important to understand that up front or you may be disappointed. 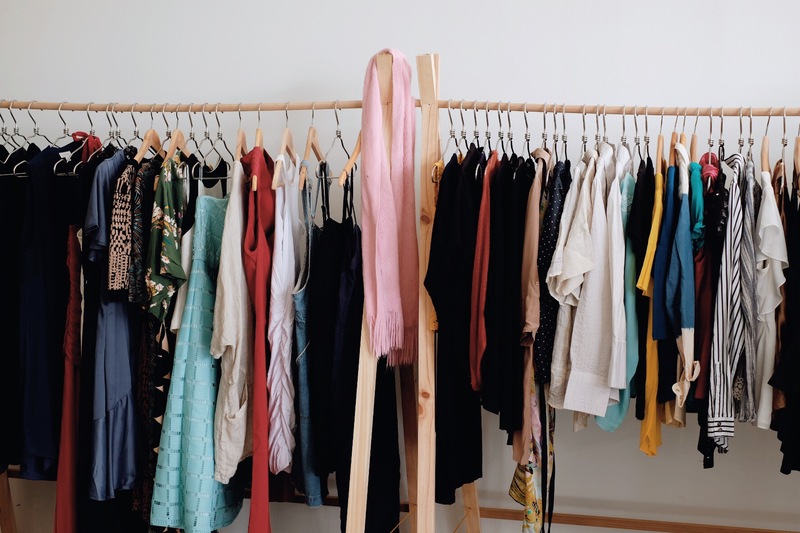 If you’re hosting a public clothing swap it’s pretty much a mixed bag as to what types of clothing you may receive. Be sure to let participants be aware of this. How do I know there will be clothes in my style? Again, you don’t. It’s a risk. This is why we also encourage participants to only bring clothes to the swap that they are happy to part with. If they are too attached to the value of the clothing they may feel disappointed if they don’t find garments they like. What happens to the clothes left over? I’d encourage you to have a solid plan for the clothing left over from the swap. We at Biome either send our donations to Suited to Success, or give them to Restitch in order to be up-cycled into new amazing creations! What if I bring more garments to the swap then I end up taking home? Perfect! You’ve downsized, well done! There is absolutely no pressure to take more garments home than you brought with you. I’ve often found participants will bring 10 garments to swap but take home anywhere between 4 and 6. Can I take things for my friends and family? Your tokens are yours to use as you wish. We often find participants may pick a few things for themselves and. if they spot something nice for their mum or bestie, they might grab that too! At the end of the day we want the clothes to find new homes so they don’t end up in land fill. This is a tricky one as across our three events so far we’ve only had women participate. In the same way that we can never guarantee certain sizes or styles, we also can’t guarantee that if we had male participants that there would be an abundance of menswear for them to swap. We don’t limit it to women only, however it seems so far to only attract women. I really hope that this break down has given you an insight into one way a clothing swap can be run, but please know that this is only one version. You can make and break as many rules as you like, it’s all about finding a style that works for you. 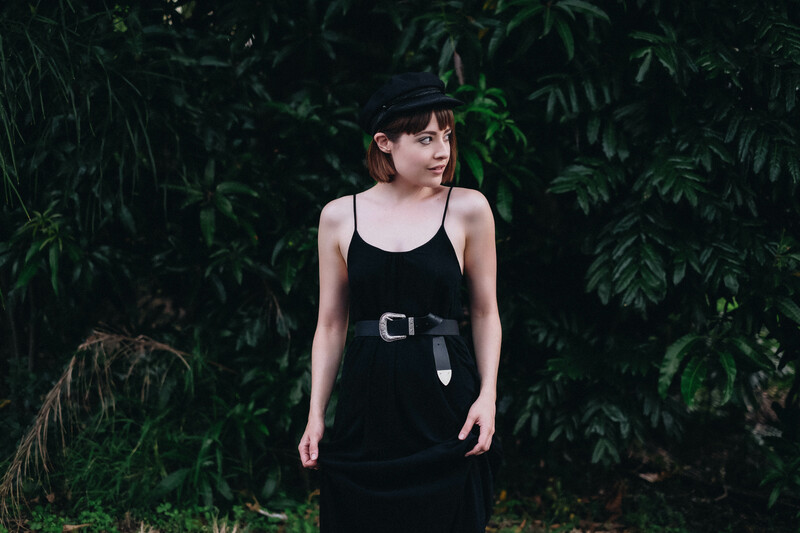 I’d love to hear about your clothing swap success stories so keep me in the loop too! I first discovered the work of The League of Extraordinary Women when I attended the Clare Press book launch for Rise and Resist. 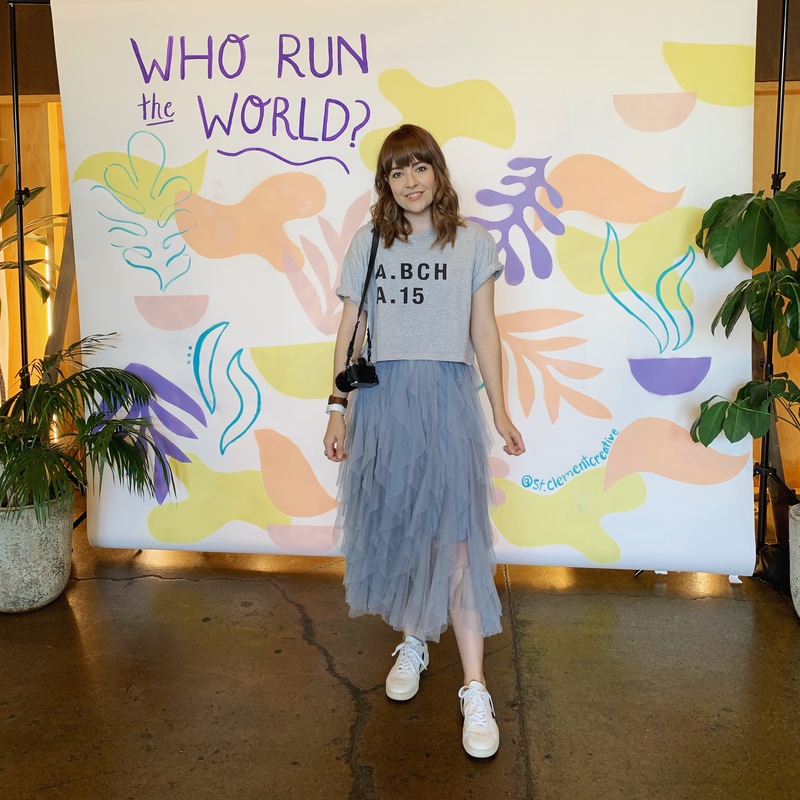 The League describes what they do as – “Our mission is to create a community that focuses on connecting female entrepreneurs and aspiring entrepreneurs to form and create authentic relationships and friendships” which is exactly what their Run the World conference was all about. And wow… was I lucky to nab a ticket! Considering there was close to 9 hours of non-stop inspiration across the Saturday event, I have decided to share a brief break down of my personal key takeaways from each speaker in the hopes that it will ignite something within you too. P.s can we take a moment to praise this artwork by my good pal Steph of St Clement Creative? Overall, her talk made me reflect on my current use of social media and how I need to actively start working on ways to tear myself away from the screen, focus on self care and create better content that comes from a more authentic place. Ale was a ball of energy and enthusiasm. This is the kind of person you want on your team when you’re ideating and coming up with business solutions that are going to change the world. The fact that she started her talk by having the audience participate in a “Mexican Wave Poll” was testament to the fact that she doesn’t like to do things traditionally. Having “bad ideas” is part of the process. Fail and move on. Her talk was fun, optimistic, energetic and packed full of useful tools. This panel addressed all the challenges facing working Women today, and weaved in and out of so many interesting topics. 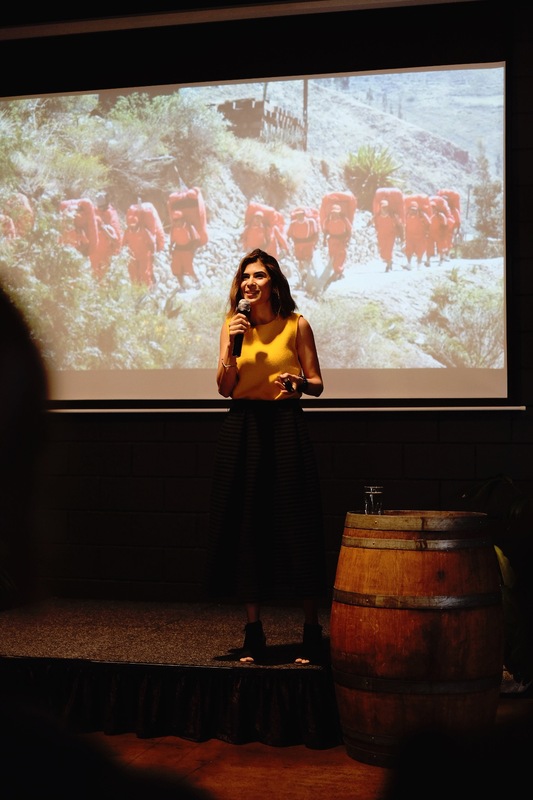 Jessy Cameron – “The day you start your business is the most wrong you’ll ever be”. 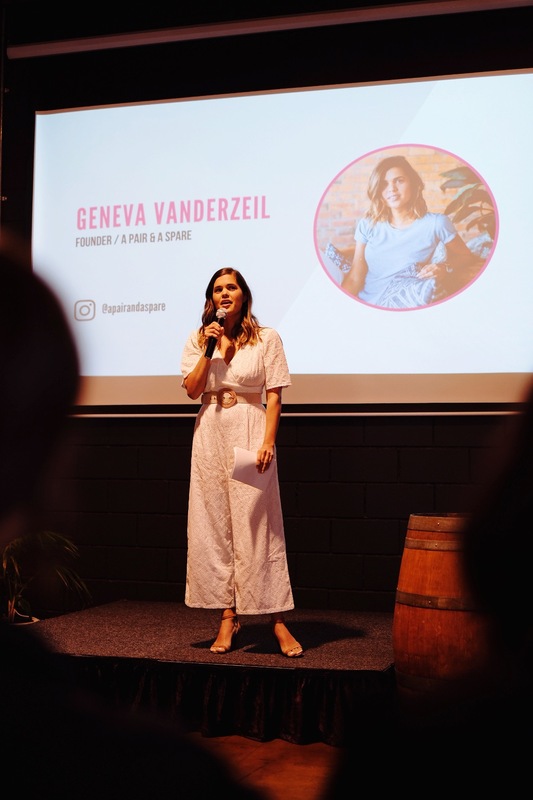 Jessy shared so many good insights about the ups, downs and pivots of owning your own business. She talked about the importance of having first hand, face to face customer feedback in order find holes in your product and make it better. My strongest takeaway was to remain flexible and to roll with the punches if you want to grow. 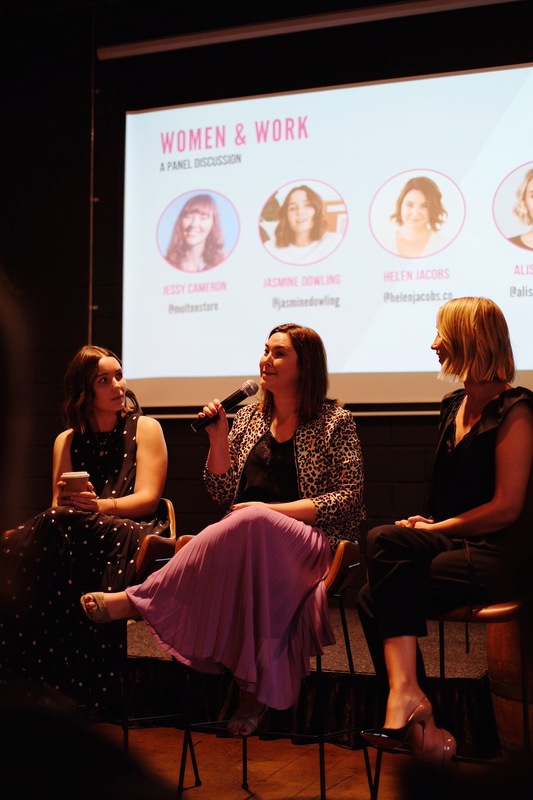 Jasmine Dowling – The best thing about hearing Jasmine talk was how much I related to her struggle with self censorship on instagram. She shared about how she got to a point where she felt too afraid to write or post anything out of fear of offending or hurting someone, which is often how I feel. What it came down to was that at the end the day, when someone has a problem with you, it’s their problem. You can’t make everyone happy, and everyone won’t always like you, and that’s ok. You do you. It was refreshing to see someone with such a massive following be so honest and candid. 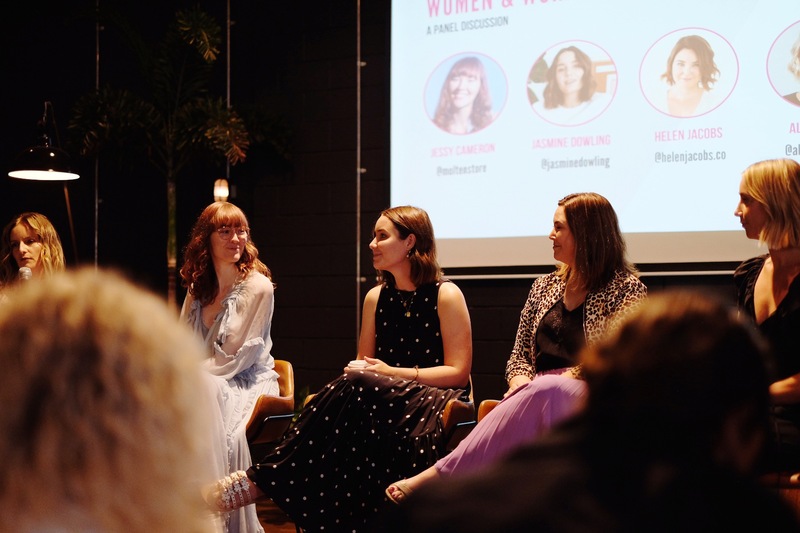 Helen Jacobs – I thought it was great the way she takes time to prepares herself mentally and physically for events such as the conference, which will inevitably be energetically draining. Prioritising self care is key. Mediation and grounding exercises help her from absorbing the energy from all the people she interacts with. Alison Rice – She actually made me want to experiment with Podcasting! Her confidence and strong demeanour made me feel like I can really tackle whatever business/workplace challenges come my way.